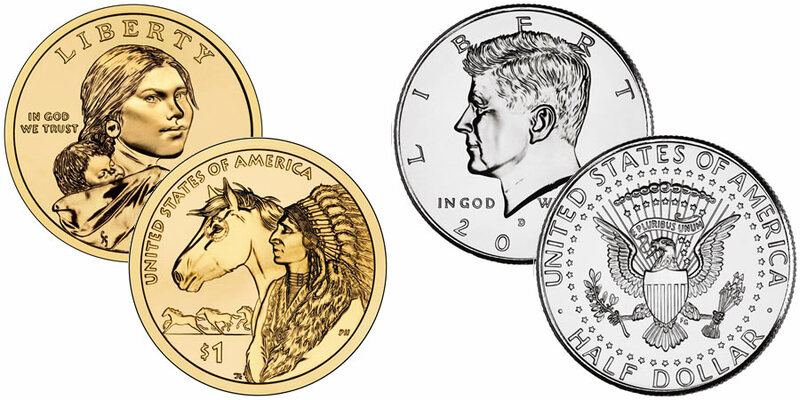 The United States Mint this week will be releasing products associated with the 2012 Native American Dollar and products associated with the 2012 Kennedy Half Dollar. These products all contain circulation quality examples of the coins despite the fact that neither is actually struck for release into general circulation. Beginning on Monday, May 14, 2012 (at Noon, Eastern), the United States Mint will begin offering 2012 Native American $1 Coin 100-Coin Bags for sale to the public. These bags contain 100-circulation quality 2012 Native American $1 Coins struck at either the US Mint's facility in Philadelphia or the US Mint's facility in Denver - buyer's choice. 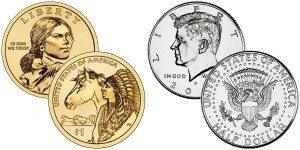 The 2012 Native American $1 Coin continues the series started in 2009 featuring reverse designs emblematic of the contributions of Native Americans to the development of the United States. Shown on the reverse is a design showing a Native American and horse in profile representing the historical spread of the horse. The reverse was designed by United States Mint Artistic Infusion Program Master Designer Thomas Cleveland and sculpted by United States Mint Sculptor-Engraver Phebe Hemphill. Obverse designs for all Native American Coins continues to depict Sacagawea. The image of the Shoshone woman who accompanied Lewis & Clark on their expedition into the interior of the United States was originally completed by Glenna Goodacre. This release comes just a few weeks after the United States Mint offered the 2012 Native American $1 Coin Boxes and Rolls for sale. Those boxes and rolls are still currently available and are now joined by the 100-coin bags. Each bag may be purchased directly from the US Mint for $111.95, plus the US Mint's standard shipping and handling charge of $4.95 per order. Beginning on Tuesday, May 15, 2012, at Noon (Eastern), collectors will be able to order 200-coin bags or two-rolls sets of the 2012 Kennedy Half Dollar Coins. Once again, these are circulation quality coins struck on the normal production floors at either the US Mint's facility in Denver or the US Mint's facility in Philadelphia. Shown on the obverse of the Kennedy Half Dollar is a portrait of the 35th President of the United States, John F. Kennedy. The portrait was originally designed by United States Mint Sculptor-Engraver Gilroy Roberts and first appeared on the half dollar coin in 1964, shortly after the assassination of Kennedy. The reverse was designed by United States Mint Scupltor-Engraver Frank Gasparro and also first appeared on the half dollar coin in 1964. It depicts a Presidential Seal motif. The 2012 Kennedy Half Dollar 200-Coin Bags contain 100 half dollars struck at the Denver facility and 100 struck at the Philadelphia facility. Each bag is priced at $139.95. Also available are the two-roll sets of Kennedy Half Dollar Coins. These sets contain one roll of 20 coins from the US Mint's facility in Denver and one roll of 20 coins from the US Mint's facility in Philadelphia. Once available, purchases for all of these products may be made by calling the United States Mint at 1-800-USA-MINT (872-6468). Hearing- and speech-impaired customers may order by calling 1-888-321-MINT (6468). Orders may also be placed via the Mint's online store at catalog.usmint.gov.